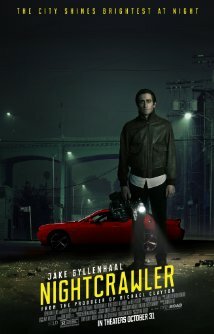 Nightcrawler has a 94% on Rotten Tomatoes at the time of writing. That is serious critical acclaim, and it’s hard not to look at that number and place some unfair expectations on a movie even when you go in as clueless as I like to (based on the poster above, I was expecting Drive). I think expectations like these have negatively impacted my experience on a few occasions; and, especially given my appreciation for Jake Gyllenhaal, I was concerned that that might be the case with Nightcrawler… until about five minutes in. I don’t remember the last time I simultaneously loved and loathed a character like I did Louis Bloom. I’ve come to really appreciate acting over the last few years, and performances like Gyllenhaal’s are a major part of that. It was a little startling seeing the guy who was once the sweet, naïve “Bubble Boy” playing an incredibly slimy, creepy, but still undeniably charming (to me at least) media analogue of an ambulance chaser (Full disclosure: it wasn’t really startling. 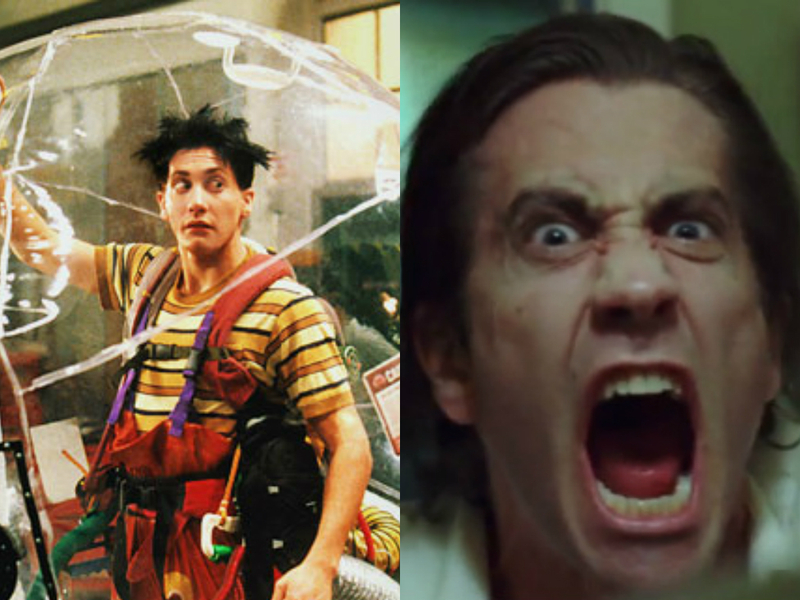 Gyllenhaal has played a lot of dark, troubled characters over the years, Donnie Darko being arguably my favorite). Bloom epitomizes the go-getter, and, as someone who’s introverted and generally timid, I found his energy and drive admirable and enviable. The depths that Bloom would sink to for the success of his business were indisputably disturbing… but what I found even more disturbing was the fact that I was time and time again rooting for him. I’m not sure if that’s a testament to Gilroy’s storytelling abilities or Gyllenhaal’s commitment to the role or some darkness in myself that I haven’t yet faced (things just got serious)… but regardless, any combination of those factors left a serious impression. What happened to you, Jake…? Bloom’s associate Rick (Riz Ahmed) had a great, uncomfortable chemistry with Bloom, serving as his foil and the voice of reason and normal, decent human ethics (hopefully a voice that was in tune with the audience’s). It was a relief to see someone you didn’t have to feel guilty rooting for. And beyond that, Rick provided some perfect, tension-cutting comedic moments through his interactions with Bloom. I’m not someone who likes digging for social commentary in the movies I watch, but I found there were some compelling comments on capitalism and greed that I just couldn’t avoid reflecting on. Bloom struck me as an emblem of the ideal entrepreneur: smart, motivated, hard-working, singularly focused, and cutthroat. Hungry for knowledge in the age of Google, Bloom dug up and studied every single topic that he figured could help him advance his business and then expertly applied the techniques and concepts he found. But like so many people we hear about in the news, he did not find it necessary to draw the line… well, pretty much anywhere. He manipulated and controlled whomever he needed however he could to get what he wanted… and he went completely unpunished. In fact, all we learn from his example is that absolute ruthlessness (up to and including indirect murder) is condoned and even rewarded by our society. The other larger social commentary concerns the focus of America’s TV news (along with other media outlets, I imagine) on the sordid, violent, and shocking. But then again, the only reason that journalists obsess over showing us this unsavory (and ultimately fruitless) material is because the public obsesses over it. They will continue to give us what we want because that’s how their money is made. As for us constantly wanting it, well, that’s another issue entirely. I got a comment that my previous review had an “academic tint” (not something I want or expect from myself), so I won’t dive too deeply into how much I appreciated the thoughtfulness and attention to detail in the framing and composition of shots. I unfortunately don’t have more than a cursory understanding of cinematography, but I frequently found myself in awe of the simple but elegant visuals of the movie. We didn’t see grand vistas or spectacles, but effort was taken to really maximize beauty in what would normally be pretty mundane interior scenes or cityscapes. Bloom even gives the audience a little lesson on framing a shot, a little near fourth-wall breaking from which I gained no small measure of pleasure. Nightcrawler has most everything I could ask for in a film. It’s a dark, disturbing tale with troublingly real characters (as Citizen Kelvin will attest, Bloom is almost the spitting image of someone we know) in surprisingly thrilling situations. I didn’t know what to expect when I took my seat, but I soon had the feeling I was witnessing something special. That feeling hasn’t left me after days of raving about it and now writing this review. All I really have left to say is this: with just over a month and a half left until 2015, Nightcrawler is my movie of the year.